Abu Dhabi, UAE – 27 November, 2018: The International Union for Conservation of Nature (IUCN) has placed the Al Wathba Wetland Reserve in Abu Dhabi on its Green List of Protected and Conserved Areas. The global recognition underscores the efforts of EAD in developing the Reserve since its designation as a protected area in 1998, and is a realisation of the vision of the UAE’s founding father, the late Sheikh Zayed Bin Sultan Al Nahyan to provide a safe environment for migratory birds and breeding area for the Greater Flamingo. This is not the first time Al Wathba has receives international recognition; in 2013, it became the first area to be designated a Ramsar site in Abu Dhabi for protecting the Emirate’s natural biodiversity and several endangered species. Al Wathba is the first site in the region to make the Green List of Protected and Conserved Areas, after completing a series of comprehensive evaluations and assessments that have confirmed EAD’s success in managing Al Wathba in accordance with internationally-benchmarked models of governance, design and planning, management and conservation. The announcement was made during the Fourteenth meeting of the Conference of the Parties to the Convention on Biological Diversity (COP 14) in Sharm El-Sheikh, Egypt, which is being held from the 17 – 29 November 2018. The IUCN Green List is a global standard for protected areas that ensures all certified sites fulfil three major criteria: good governance, effective management, and sound design and planning. In addition, the standard requires that the site demonstrate successful results from conservation efforts. The certificate is valid for 5 years, where the site should continue making improvements to the protected and conserved area on the Green List. The programme includes a set of 17 criteria that measure several indicators for the protection of wildlife and ecosystems, as well as an assessment that evaluates the role of protected areas in providing services to people and communities. Al Wathba Wetland Reserve, the first area to be designated, is home to over 4,000 flamingos and 260 other birds, 320 invertebrates, 35 plant species, 16 reptiles and 10 mammals. 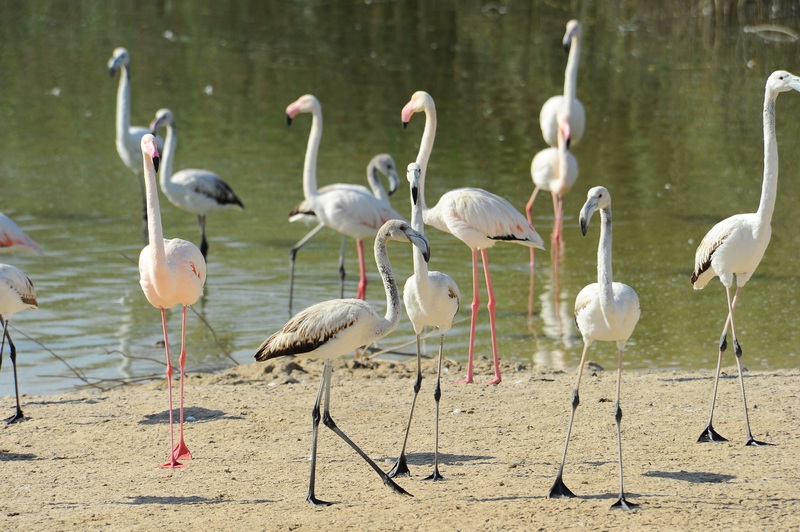 It is the only site in the Arabian Gulf where the Greater Flamingo breeds regularly; this year, 601 flamingo chicks hatched at the Reserve – the highest number ever recorded at Al Wathba. “Al Wathba is an amazing example of what can be achieved with hard work by men and women working to protect and manage the environment” comments James Hardcastle, IUCN’s lead on the Green List programme. “This was possible through the vision of EAD and the strong political will to help turn their plans into reality. IUCN recognizes the significant results of their work, as demonstrated by the outstanding numbers of flamingos that breed here”. Since opening to the public in October 2014, Al Wathba has attracted approximately 20,000 visitors and bird watching, hiking and photography enthusiasts alike. The Reserve re-opened for the 2018-2019 season on 1 November and is welcoming visitors from 8 am to 4 pm (last entry at 2 pm) every Thursday and Saturday. Guided tours for students and other large groups can be organised by prior request by emailing EAD’s Customer Service Office atcustomerhappiness@ead.ae; Tuesdays and Wednesdays are reserved for school trips.